Natuurhistorisch Museum Rotterdam: Whales of Doom! The Natuurhistorisch Museum Rotterdam is tucked away in a rather unassuming location in the city's Museumpark, but is impossible to miss on immediate approach thanks to an outsized dinosaur silhouette standing proudly outside, while a sperm whale skeleton looms from within the building's glass extension. Thanks to a temporary exhibition (open until 2013), visiting the museum at the moment is all about whales - quite possibly the second most awesome group of animals to have ever lived. Nature invents the best monsters. Livyatan melvillei, the gigantic physeteroid (or sperm whale relative, if you prefer), seems far too preposterously terrifying to ever have really existed. But exist it did, some 12 million years ago alongside the equally ridiculous 'Megalodon' shark. The Rotterdam exhibition is entitled 'De grootste muil ooit', which translates to 'the biggest mouth ever', and undoubtedly riffs on a quote from the paper describing the beast, in which the authors spoke of "the biggest tetrapod bite ever found". It's a rather good title, although I think it should be 'WHALES OF DOOM', mostly because I thought of that and I'm well funny. As someone quite accustomed to seeing the large maws of predatory dinosaurs, my first reaction upon seeing the above monstrosity was "BLIMEY!". It's big and no mistake, resembling a squashed sperm whale skull with comically oversized spikes o' doom jutting from its jaws. Livyatan (they wanted to call it Leviathan, but that was preoccupied) was almost certainly a fearsome apex predator, gobbling up other, smaller whales like they were minnows rather than, you know, bloody whales. 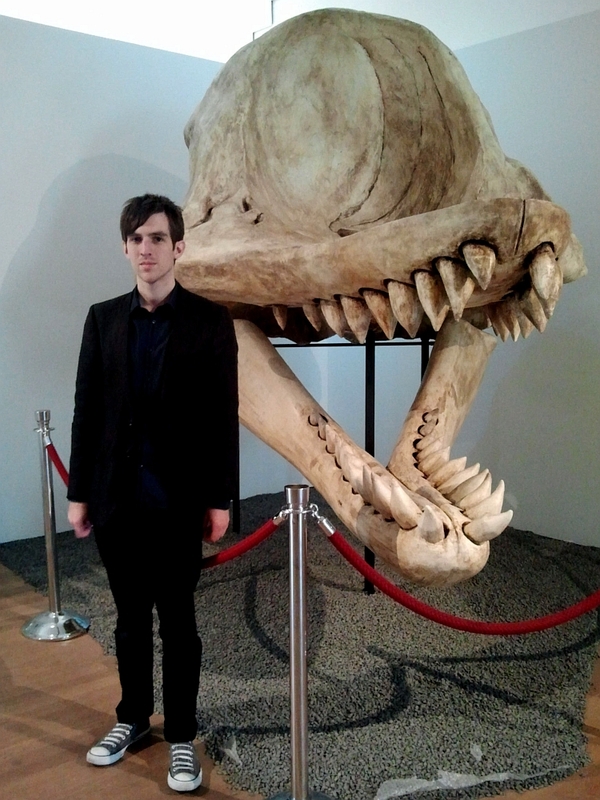 In the picture below, you can see just how large this animal's reconstructed skull is next to a rather serious-looking dorky man. The Rotterdam museum is hosting this exhibition as a team of theirs was involved in this whale's discovery in Peru. The mounted skull reconstruction is accompanied by this very lovely artwork. Unfortunately, I didn't take note of the artist's name - if anyone out there does know who painted this, I will be all too happy to put things right. Somewhat later, and smaller, but no less ferocious-looking, Acrophyseter deinodon was discovered in the same part of the world as the mighty Livyatan. The specific name 'deinodon', or 'terrible tooth', is simply perfect. The oceans of 12 million years ago were a weird world in which miniature baleen whales were gobbled up by gigantic great white-like sharks and sperm whale-like predatory whales. The museum presents an example of the skull of such a baleen whale, Cetotherium. Unfortunately, I can't remember the species...gah! I can only apologise. The Peruvian fossil whale exhibition really is fantastic, and is easily worth the six euro entry fee on its own. Generous space is given to examine the whale skulls from every angle, and the fascinating and lengthy signage text is provided in both Dutch and English. I'm certainly not finished with this museum, either - in spite of the lack of nonavian dinosaurs, you can be sure there'll be more in the next few days! But for now...bonus nerd-o-points to anyone who can identify this skull, and why it might be in an exhibition alongside Livyatan. What's left to say about Zdeněk Burian? 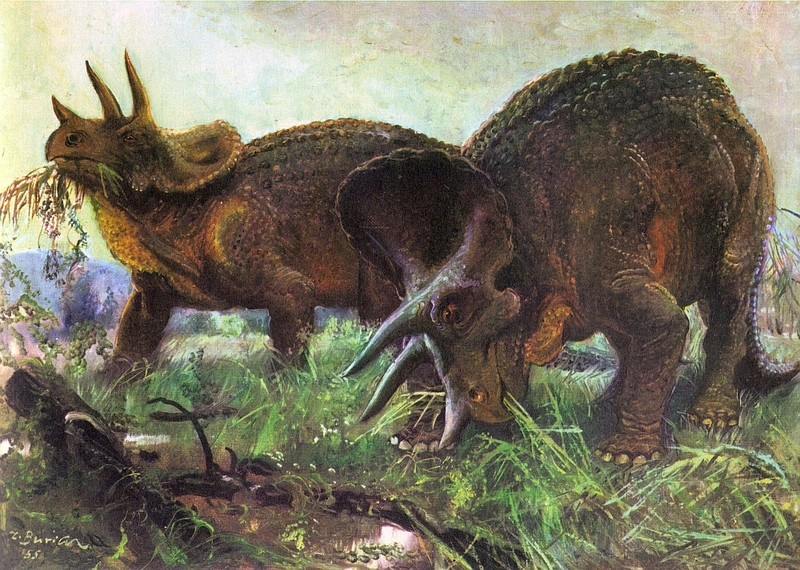 One of the all-time Grand Masters of palaeoart, Burian's paintings have enthralled generations, and have no doubt inspired countless children to become palaeontologists and/or palaeoartists themselves; David's also posted on him once before (please forgive me for covering some of the same ground). Life before Man, with text from Zdeněk Špinar, provides a breathtaking collection of his very best work in which dinosaurs do not completely dominate (which is quite an achievement, given that they are the most awesome and bestest animals ever to have existed ever). Of course, this is LITC and much as I know many readers will want to see mosasaurs and mastodons and more besides (and they are coming), the dinosaurs have got to come first, and this 'hero Tarbosaurus' is one of the most memorable. It's worth remembering that, although Life before Man was published in 1972, many of the paintings in this book are rather older - sometimes by decades. 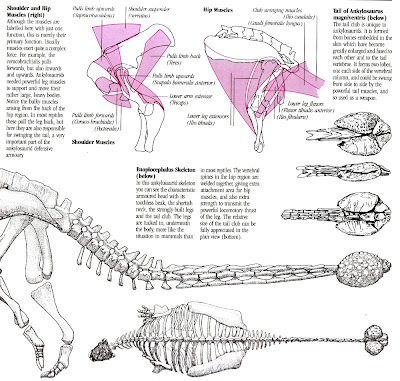 Burian was ahead of his time in giving dinosaurs more realistic muscles to support their often massive frames, and more dynamic and exciting postures in keeping with their obvious upright gait and adaptations for quick movement - things that seem obvious now, but ran contrary to received wisdom in Burian's time. This Tarbosaurus is noteworthy for its elevated tail and obviously alert posture - it appears to have snapped its head around to respond to a challenger. Even now, although a little outdated scientifically, this beautiful painting (just look at that sky!) is probably the most striking of Burian's dinosaurs. Composition is key, and helps draw the viewer's gaze up to meet the animal's beady eye and flashing teeth. Simply a masterpiece. 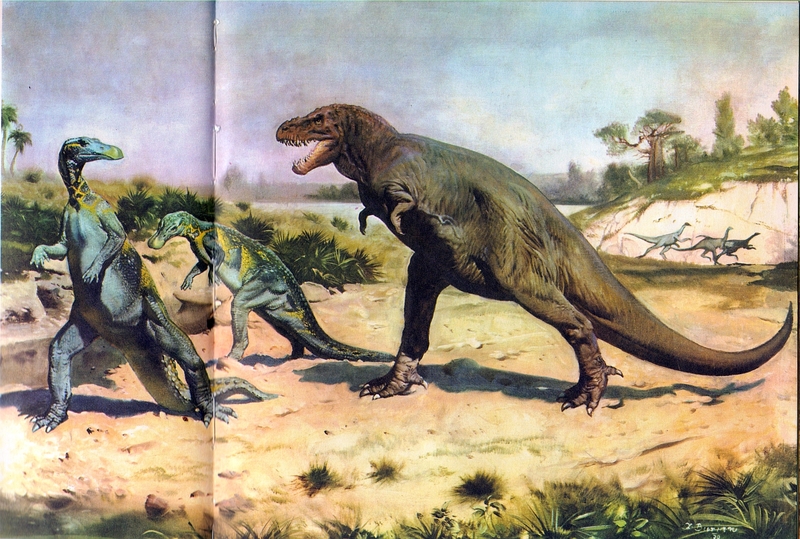 Surprisingly, it's not Tarbosaurus on the book's jacket, but rather good old T. rex, depicted rushing to attack a pair of hadrosaurs (labelled "Trachodon", for which you should probably read Edmontosaurus in this case). Again, the animal is depicted in an uncharacteristically active light for the period, taking long strides and with its tail clear of the ground; the hadrosaurs have clearly been taken by surprise. Note also the Ornithomimus fleeing in the background. 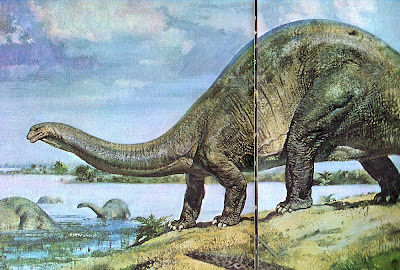 Good old Bronto now - an animal that never really existed (at least, not looking like this - with a blunt head and too-short forelimbs), but became a firm fixture in popular culture. 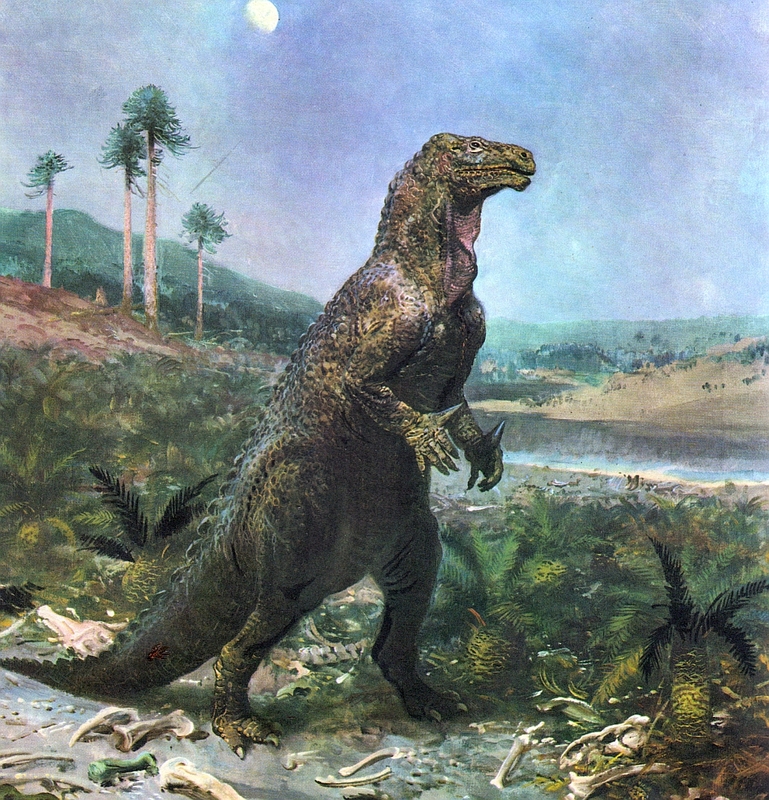 In spite of this, Burian renders it as an utterly convincing creature, with a palpable heft to it, bestriding the Late Jurassic plains and putting everything else in the shade. That 'bestriding' is important, as such a portayal of an elephantine, terrestrial sauropod was still unusual at the time. Burian's beast very clearly also has huge muscles with which to hold up its ponderous bulk on dry land. It can perhaps be considered a watermark, so to speak, in the history of these animals in art. 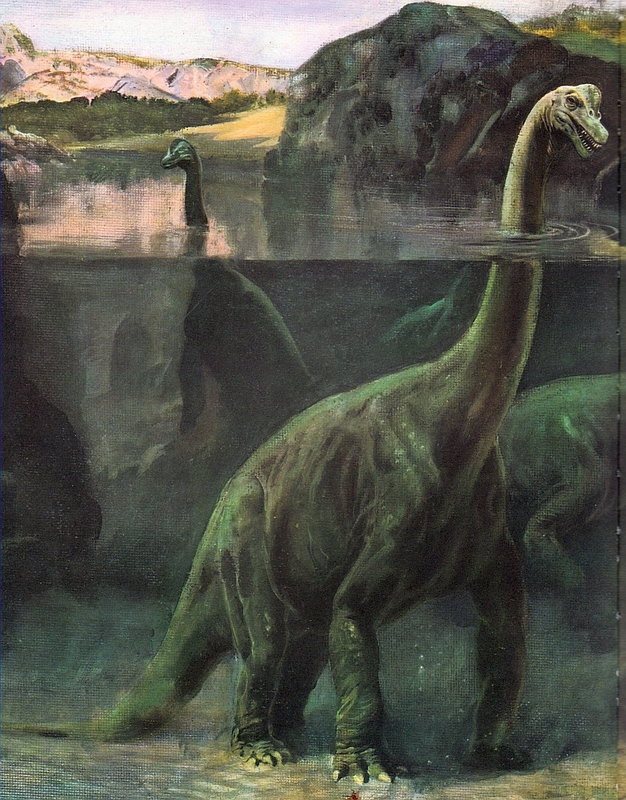 A piece that hasn't aged as well is this one, depicting a group of amphibious Giraffatitan in their natural habitat of Loch Ness. It was always a silly idea, but of course the Burian painting is still very beautiful, providing a wonderful cross-section of this murky, bizarre, somewhat unlikely world. I would also like to draw your attention to Burian's positioning of the animals' nostrils at the front end of their nasal crests, rather than halfway up, which hints at an intuitive grasp of anatomy derived from years of natural history painting. Burian's Stegosaurus is more in keeping with his contemporaries', and with earlier works by artists like Charles R Knight - sprawling and tail-dragging. Life before Man makes it possible to see the evolution of Burian's style over the decades - while always sticking with a quite traditional palette, his later pieces are far more refined than this one, which nonetheless remains a notable achievement. Again, Burian was a great artist, not merely a great natural history illustrator (not that that's to be sniffed at, you understand). Without doing any more than feeding, these Triceratops manage to convey their majesty and power, their different poses subtly suggesting a great swinging head movement, the horns thrust impressively upward (oh dear, I'm at it again) as the animal rips plants from the ground. It just wasn't Burian's style to paint animals in bloody, violent combat, and here Triceratops comes into its own without a marauding tyrannosaur in sight. 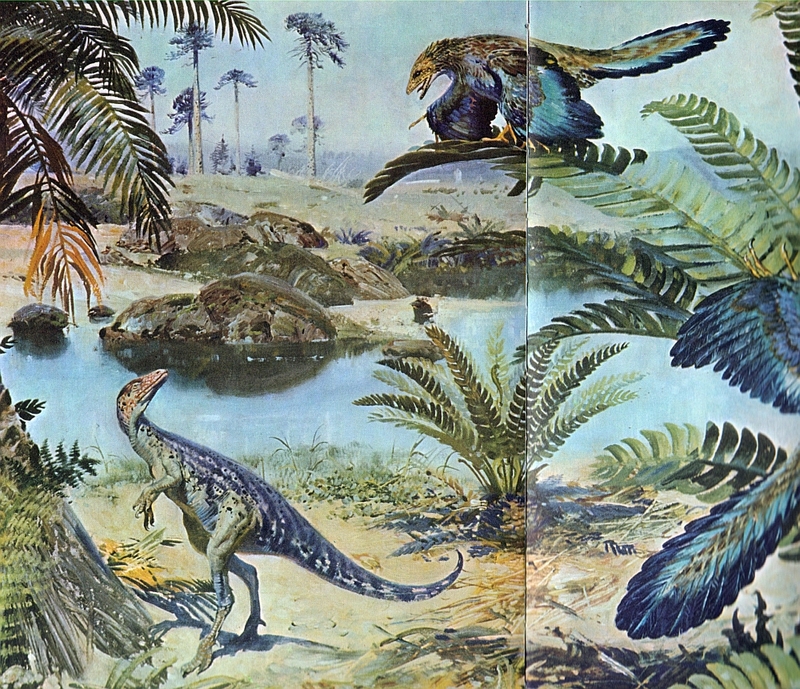 Compsognathus and Archaeopteryx feature together in one of Burian's more colourful scenes. 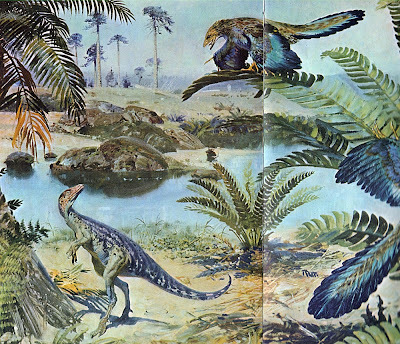 Happily, Burian didn't paint his Archaeopteryx with stick-on mini-hands, and so it remains a rather good restoration of this feathered dinosaur to this day. His Compsognathus is remarkable too - poised, with powerful legs and a highly alert air, not to mention a stunning colour scheme. And finally, an extra special curiosity - a lizardy proto-bird from a time before the dinosaur-bird link was fully accepted. 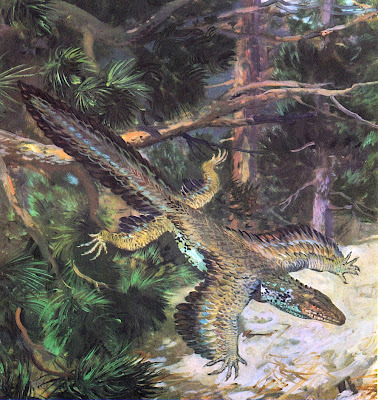 Of course, this very old hypothesis would be vindicated with the discovery of 'four-winged' feathered dinosaurs in China, even if they didn't exactly move about in this fashion (this sort of posture would pop the legs of Microraptor out of their sockets). Indiana is currently experiencing a growing trend in shootings of raptors. This is a serious federal offense, carrying huge fines, but nonetheless my friends at Indiana Raptor Center are admitting more and more birds of prey suffering from gunshot wounds. They're usually fatal. Updates on the Facebook group for the center invariably gain many hopeful comments, only to be dashed with news that euthanization was necessary. "70% of all raptors die withing the first year of their life. Rehabilitation centers report collisions, shootings, electrocution, and pesticide exposure as common causes for admissions." Today on Twitter, I had a brief conversation with Sharon Wegner-Larson about conservation efforts, and the cynicism of appealing to peoples' self-interest in these matters. It is cold and calculating, but it's also necessary. In fact, it's been a strong through-line in much of my work over the last few months. This poster, inspired by a similar one used a few years ago in the State of Wisconsin, has that strategy in mind, making the point that while raptors may claim a few chickens, they more than pay their way by keeping potentially costly rodent populations down. If you can't hit the heart, aim for the wallet. It's often a larger target. Illustration of Microraptor and Sinornithosaurus by Emily Willoughby, used with her permission. Click to big it up. 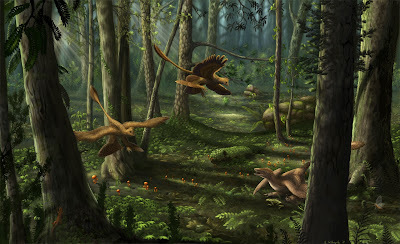 So, when I look at evocative pieces of paleontography like the above Liaoning scene by Emily Willoughby [blog], I have to wonder: even if the asteroid hadn't done the trick, who's to say that previous generations wouldn't have wiped out surviving non-avian dinosaurs by the time our current generations arrived on the planet? Our endless appetite for fictional dinosaur carnage doesn't speak well of their chances, certainly. Maybe it's for the best that so many are gone: it allows us to keep them alive in idealized worlds of our own choosing, safe from our baser instincts. Perhaps these fantasies of lost worlds can help us appreciate our own, and protect the avian dinosaurs with whom we still share the planet. I suppose many of us have dinosaur wishlists. 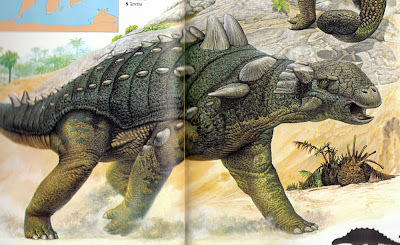 At the top of mine right now is The Giant Golden Book of Dinosaurs, featuring the illustrations of Rudolf Zallinger. If you haven't seen yesterday's Vintage Dinosaur Art post, you'll see why: the primitive paintings I was delighted by when I saw them decorating the shuttle at Dinosaur National Monument turn out to be highly derivative of Zallinger's Giant Golden Book work. This is one I haven't come across in my excursions to junkshops and antique stores. I suppose I could buy a used copy online, but that would kill the thrill of the hunt, wouldn't it? Another piece of vintage dinosaur kitsch near the top of my wishlist is the DVD collection of Valley of the Dinosaurs, released last year by Warner Home Video. The show was a Saturday morning staple in the '70s, and has been featured on the Boomerang network, along with a bunch of other old Hanna-Barbera toons and more recent Cartoon Network shows. Its concept is pretty similar to Land of the Lost, though changed so that the core characters are two nuclear families, one of modern humans and one of cave-people. In fact, if Wikipedia is to be trusted, the shows actually debuted on the same day and aired for roughly the same amount of time, though only 16 episodes of Valley were produced. Being a WB property, it's not available on Youtube, other than a couple rips of the intro and some official promos. One Valley item has made it into my collection, though: an old puzzle. I'd love to see a reboot of this, only upping the scientific accuracy and setting the family in a specific age of the Mesozoic, perhaps setting them among one of the communities of the Jehol biota. I appreciate the old-fashioned depiction of the Mesozoic Valley offers, but I'd like to see shows other than Dinosaur Train explore dinosaurs in a way that reflects the amazing discoveries of the last twenty years, and do it with some depth. For a good review of the show, check out Michael May's write-up on the series from last year. Harvey Birdman, Attorney at Law also visited the valley, though there's a distressing paucity of dinosaur action in the episode. One final bit of cool trivia with local interest for me: the voice of Greg Butler was provided by Jackie Earle Haley, most famous in Bloomington as Moocher in the movie Breaking Away (required viewing for new Bloomingtonians), although he may be better known as Rorshach in the Watchmen movie and the new Freddy Krueger. I have a John Sibbick book of my own to share, but I've decided to hold back and give the kind readers of LITC a little break. Instead, today I'm sharing a collection of dinosaur illustrations that decorate the shuttle which operates within Dinosaur National Monument, taking visitors to the visitor center protecting its most famous landmark. In keeping with the monument's focus on the history of paleontology, they are throwbacks to the saurians of mid-century dinosaur books, possibly one we might have featured in this ongoing series. 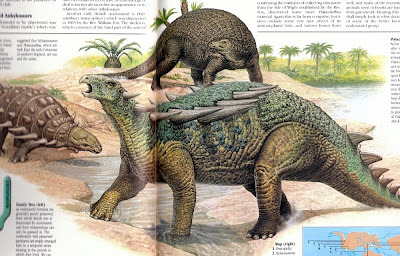 UPDATE: Indeed they are - readers have pointed out that these are derivative of the Giant Golden Book of Dinosaurs, featuring Rudolf Zallinger's work. That's one I've wanted to find for a while but never have. The paintings, which encircle the shuttle's two trailers, covering just about every panel large enough to accommodate artwork, are the work of Kay Thunehorst, an obscure artist with zero presence on the toobs. I've put out feelers to find when these paintings were made, and will update with what I find out. Continuing the tradition of presenting iconic non-dinosaurian creatures alongside the bona fide members of the tribe, the shuttle includes Dimetrodon and a Pteranodon gracing the front of the shuttle. 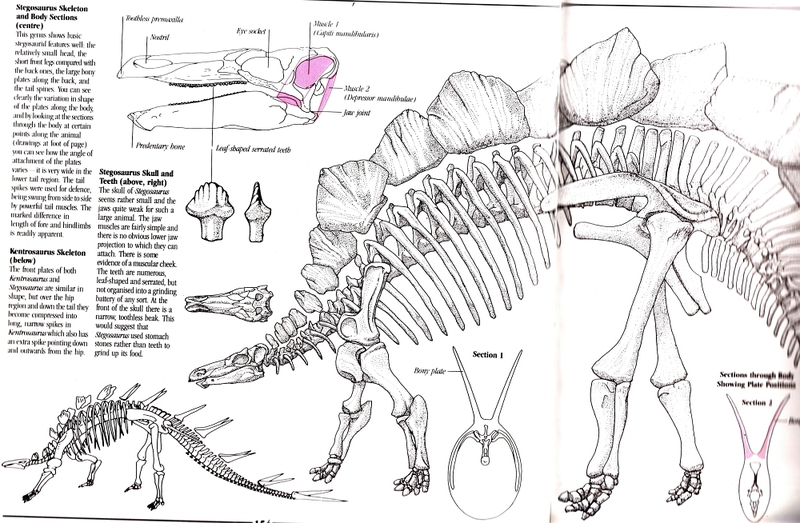 The hadrosaurs are represented by Lambeosaurus and the taxonomic mess of Trachodon. They're joined by their relative Iguanodon, placidly giving the thumbs up. The thyreophorans are represented by their chosen delegates, Ankylosaurus and Stegosaurus. The shuttle wouldn't feel right without sauropods, of course, and Thunehorst has painted Diplodocus and a traditional, swamp-bound Brachiosaurus. The third sauropod is a return to one of my favorite tropes: Gory theropod attacks on the docile giants. Here it's the vicious Allosaurus grimly dispatching poor ol' Brontosaurus UPDATE: It's also a copy of Zallinger's take on this battle, as you can see here. Yes, there be theropods on the shuttle, as further attested by this generic member of the clan, as well as the mandatory Tyrannosaurus and our little buddy Compsognathus. These illustrations are not technically proficient, but they bear a primitive charm, and their weathered look adds a certain poignance to them. It was a pleasant surprise to see Thunehorst's cross-section of the dinosauria (pluss a couple oddballs) on the shuttle. Outdated illustrations like live on as reminders of how far we've come in the last few decades. Long may they decorate the shuttle to the Quarry Visitor Center. Speaking of which, my next post will bring us face to face with its famous wall of fossils. Special thanks to David Prus and Christina Wilsdon for pointing out the heritage of these pieces from the Zallinger illustrations. What if it was Velociraptors - in all of their feathered, pint-sized glory - digging up the fossilized remains of humans? TKToons has an idea of how it would go. Two episodes of Reverse Jurassic Park, AKA Quarternary Park have been shared at Youtube. I wholeheartedly approve. Bobbing, fully feathered Velociraptors. Enough to bring a tear of joy to my eye. Son of a Baryonyx, they've done it! There are plenty of well-worn reasons stated for love of dinosaurs. The appeal of the monstrous. The scientific curiosity. The romance of a world lost to time. Simple nostalgia. I can relate to all of these (and I'm sure there are more), but one that I think is just as important to me is the elegance of their forms. This may be particularly clear in dinosaurs since I know them primarily through graphic depictions. 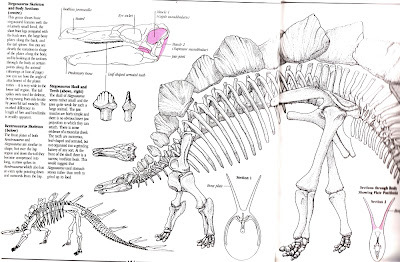 Skeletals, scale diagrams, cladograms, and illustrations that span a spectrum of realism are how we know dinosaurs (not to mention the many ways fossils themselves have been depicted as printing and visualization technologies have evolved). As a designer and illustrator, dinosaurs give me a wonderfully varied playground in which to play. My current explorations involve distilling forms to potent simple shapes, and here again dinosaurs provide me excellent material to play with. My primary tool is the pen tool in Adobe illustrator, which allows users to use Bézier curves to create scalable shapes. When I first started using the computer for graphics, the pen tool mystified me. At some point in the last five years or so, it just clicked, and now I use it so much that I occasionally daydream about creating curves. I find it to be an endlessly rewarding challenge to create shapes using the least number of points to define them. I've been exploring this in dinosaurs, combining a long-gestating interest in heraldry with the international style of graphic design. The international style is seen as too minimalist, too constricting, too boring by a lot of people, but I find it to be a fruitful source of inspiration, even if I don't bind myself strictly to it. After my experience of designing author-directed covers self-published book over the last four years, I find it liberating to be able to dispatch with the design excesses I was often instructed to use. I think of this phase of my development as a designer as finding my own style and voice by experimenting with iconic styles. Here's a work-in-progress sample of where my explorations have been leading me. I plan on covering all of the -idae level clades. I'm also considering nesting them under corresponding marks for higher clades. This opens the possibility of using color as an organization scheme (the color here is chosen for looks alone). Right now, I don't have an end goal, other than a nice big collection of colorful badges with dinosaurs on them. It's fun simply to think about the distinctive forms of various clades and find ways to distill them. How much detail is thrown out before losing the essence of the form? 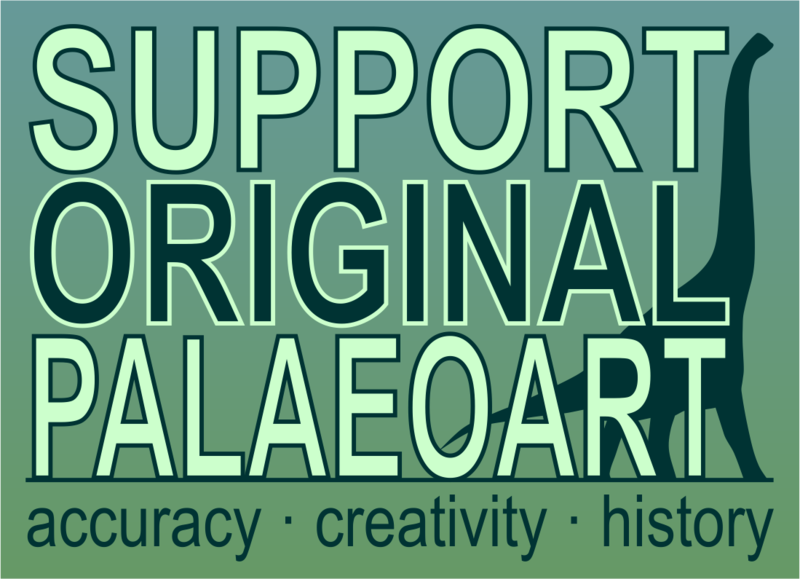 I'd love to see this develop into something that can truly communicate paleontological knowledge, but even if it just ends up being a personal project, I think it will be fruitful. It could be expressed as embroidered patches, as screenprints, or as one element of a larger project. I don't know yet, and that's what's exciting. This has also been an experiment in inviting feedback via various social networks. I've found that it's all about Facebook for me, with Flickr in distant second, Twitter behind that, and Google Plus a waste of time. It's an interesting result. I certainly don't try to put more work into Facebook, and it's not my preferred venue, but if it works, it works. I'd love to say that G+ was the winner, but it just doesn't have the traction yet. Now it will be fun to see how sharing it here will go over. Have at it! A month or so ago, Jennie and I departed the great American Midwest for the much greater American West, in an exploration of a landscape that has been etched on my memory ever since I first glimpsed it as a kid. I've only passed through or flown over since then, so this two-week ramble around the Great Basin was long overdue. In planning the trip, we were a bit overambitious, and though we had trimmed it back once already, by the time we hit the road and got a feel for how long things actually take, we rearranged things again to lessen the amount of time driving. Hint: arriving at the gates of a national park usually entails another couple hours of driving. Along the way, I took gigabyte upon gigabyte of photographs, which I'm only about a third of the way through sorting and processing to share at Flickr. These photos naturally included the dinosaurs we saw along the road. I'll start my short series of posts inspired by the trip with some of these charismatic creatures of the Mesozoic. My favorite was a Spinosaurus perched outside a rock and fossil shop in Orderville, UT, a small town sitting between Bryce Canyon and Zion National Parks. As we rounded the bend in Rt. 89 into town, this guy came into view, and it was impossible not to stop. Not the most accurate by-the-book spinosaurid you'll ever see, but refreshingly depicted in a posture that's kind of right. For sheer volume of roadside dinosaurs, it's hard to beat Vernal, UT, a short drive from Dinosaur National Monument. Some have seen better days, such as this dopey pink sauropodosomething. Outside of a hotel, there's a green, spiky-backed sauropodosomething with a rather uncomfortable electronic sign on its neck. There's also a T. rex, naturally depicted in classic man-in-suit posture, as any red-blooded American tyrant dinosaur should be. He's also a bit of an angler, it would seem. 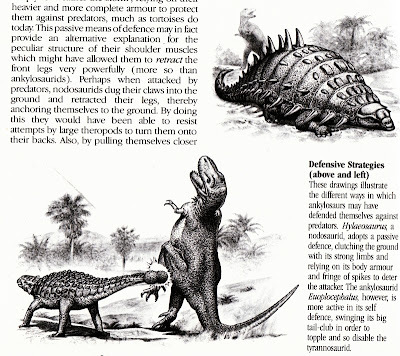 The best Vernal has to offer is a Morrison tableau featuring Ceratosaurus, Stegosaurus, and Camarasaurus. ... by bashing him in the tender underparts. You want a close-up of that, don't you? As you approach the Utah entrance of Dinosaur National Monument, a gift shop boasts a big green sauropod of its own. Like most sauropods you see on the side of the road, the sculptor likely had no specific taxon in mind. Just a long neck, long tail, and some pillar legs, and you've got what springs to 90% of folks' minds when they hear the word "dinosaur." Now that we've come to the gate of DNM, we'll be entering the park to check out the new quarry visitor center. 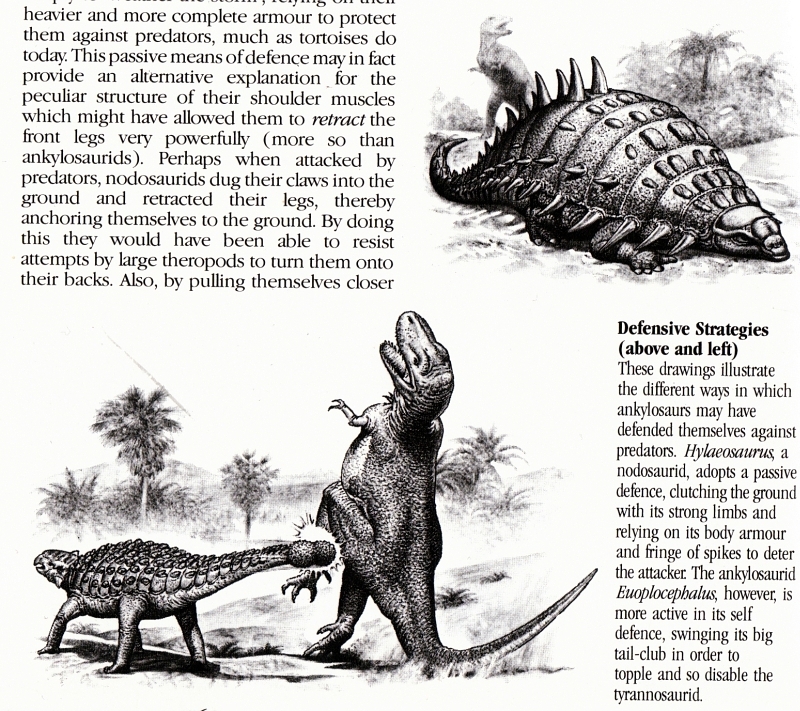 Before that, I'll share some vintage dinosaur art photographed in a surprising place. Stay tuned! An ostrich (Struthio camelus) doing something rather unlikely at Chessington World of Adventures. 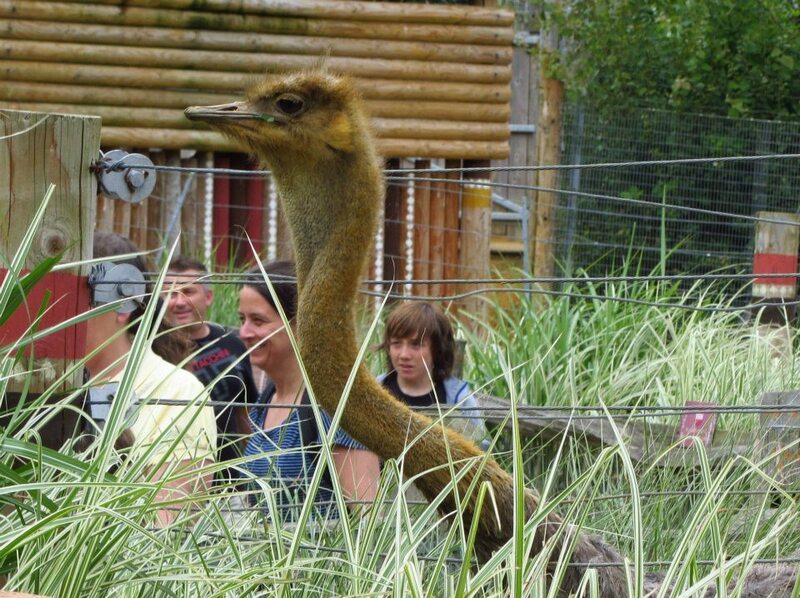 I find ostriches rather unnerving, and I hope this photo goes some way toward explaining why - apart from being much bigger than the vast majority of birds one is used to, they have diminutive heads perched on the end of ridiculous, pipe-cleaner necks. This isn't actually the most absurd pose that this individual pulled while feeding on some plants just outside its enclosure - at one point the neck pointed straight up at the base, bent almost at a right angle to fit through the fence, then bent up at another (near) right angle, and back once more so that the head was in a more-or-less horizontal position. Anyway, the point of all this is that Niroot (who was there! He was! And he took the photo!) commented that if ostriches were only known from fossils, and he drew one in that position, he'd be lambasted for drawing the animal in an anatomically impossible pose. And he's probably right! Of course, freaky as they might be, ostriches are really very cool animals; as the largest extant dinosaurs, they make it easy to envisage their huge, long-lost distant relatives. A point that's often made, perhaps, but true. And if these (mostly) herbivorous theropods are a bit offputting, imagine coming up against one with a huge head full of teeth. Feathered nonavian dinosaurs: if they're not just a bit scary, you're doing it wrong. Ah, the home straight. If you've followed us all the way through parts one, two, three and four, I salute you. And now...spiky things. I received a whinge last week as I'd missed out the Scutellosaurus. Well, I had a plan for him all along, doubters! (As for Heterodontosaurus, well...there's bound to be a point in the near future when I become desperate for material.) 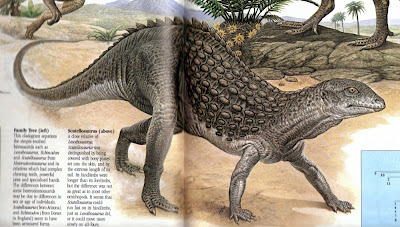 Scutellosaurus was an early member of the Thyreophora, the clade containing the stegosaurs and ankylosaurs, and its rendition here is rather lizardlike, the dragging tail in particular. ...the skeletal which, as with so many others in the book, is anachronistically old-fashioned even for the 1980s. In fact, it looks to be based on Marsh's from the 1890s, which was seemingly the basis for every restoration of the animal for decades. Still, beautifully drawn as always, and you've got to appreciate the multiple angles and close-ups of the skull, teeth and even vertebrae (very unusual for a popular book). 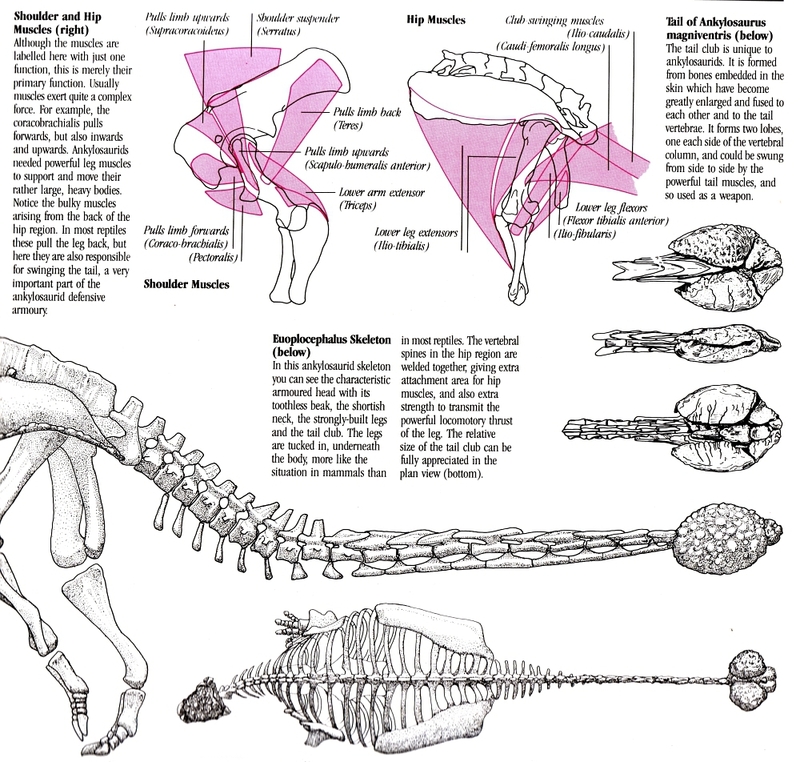 This Scelidosaurus is a very active-looking creature, a world away from earlier restorations that gave it sprawling limbs and a dragged tail. Its alertness is particularly emphasised by the upright position of its head and neck. It's a lovely illustration, and it seems odd that this is one of the less reproduced/copied out of those in this book. 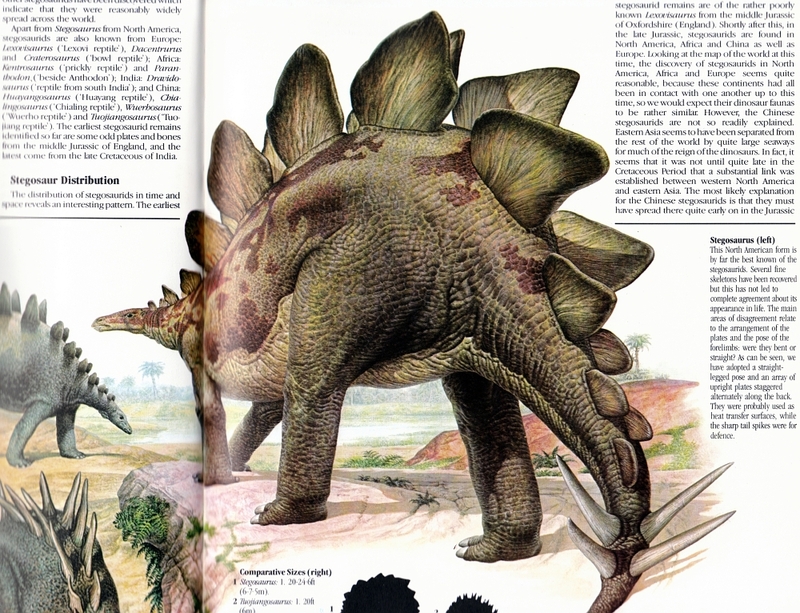 Polacanthus; I've been riding on one, and this illustration became the definitive 'look' of this dinosaur for many people, especially as it was copied so much. In fact, I've known nostalgic twenty-somethings to get all upset when they find out that modern restorations of this animal are rather different (I'm not sure why - they're also spikier and far, far cooler). Its something of an evolution from Neave Parker's lizardy version (and the hideous Blackgang model obviously based on same), retaining the dragging tail while being rather more muscular and less...fat. 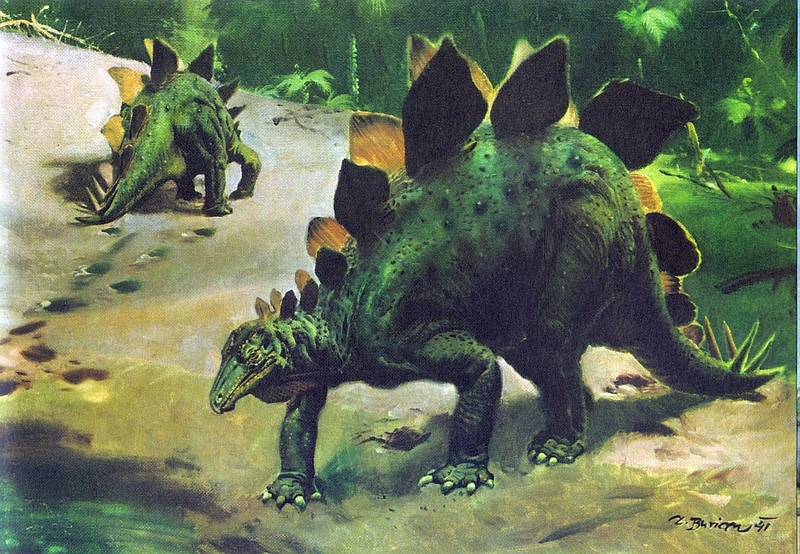 Oh, and Nodosaurus and Hylaeosaurus too. Another highly influential illustration, and undoubtedly one of the best of all. Rarely has an ankylosaur looked so dynamic, so exciting, so...furious! The viewer is really drawn into the animal's tiny, yellow eye as well, which is quite remarkable given how distracting all those spiky bits are. ...including this one. 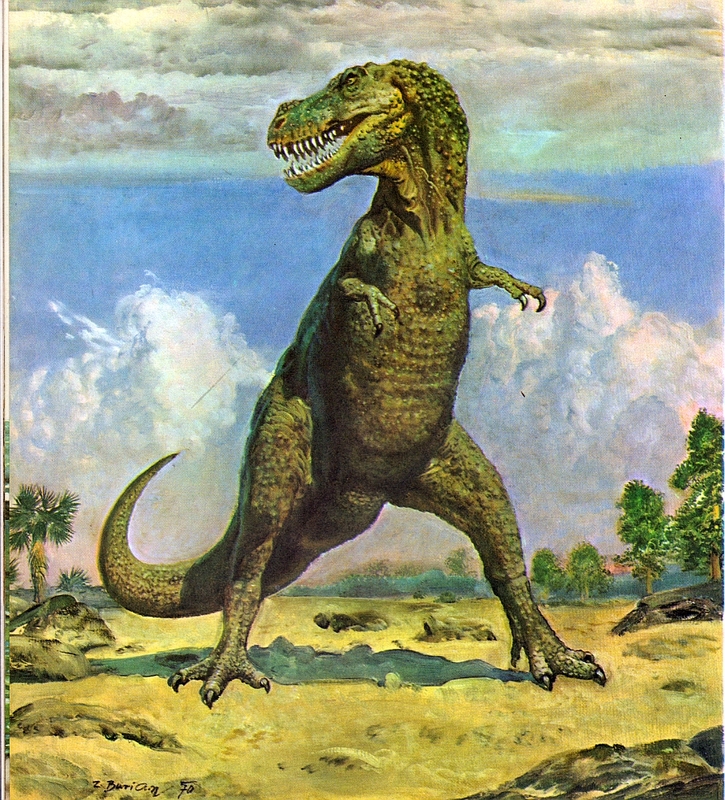 You've got to hand it to tyrannosaurs - they know how to strike a pose. This one's somehow toppling backwards, presumably while emitting an operatic cry of intense emotional trauma and aiming an eye at the critics in the crowd as the curtain falls. A suitably dramatic finish!